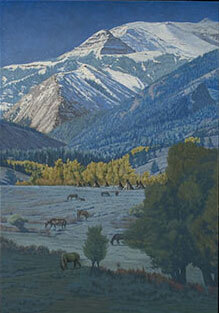 This painting depicts the Franc’s Fork of the Greybull River, in the Big Horn Basin of Wyoming, with Franc’s Peak towering above a favorite hunting ground for both Shoshone and Crow Indians curing the nineteenth century. This is a limited edition of only 50 Giclee canvas prints signed and numbered by the artist. The image size is 18 X 26 ¼ and they come mounted on archival foam core ready for framing. The price is $600.00 plus $70.00 shipping.